← Hustle’Her (CCR & Team England) – One Tough Cookie! We’ve had our summer holidays, put our feet up for a bit and now feel refreshed and are ready to go! A week on Saturday we welcome Lincolnshire Bombers to Birmingham for their first away bout at CCR. During the last encounter back in Feb 2010, CCR’s Centrinnians ran away with the spoils up at Lincolnshire, and this time its the turn of CCR’s Slay Belles to take on the Bombers in what promises to be a keenly fought bout. 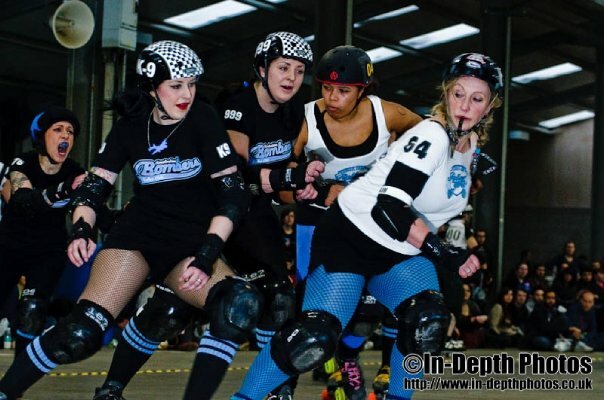 Both teams are on a run of decent results – The Slay Belles getting the better of Dublin, Glasgow B & Manchester Roller Derby while the Bombers have having lost out to Royal Windsor & Sheffield, recently beat Blitz Dames and Manchester.